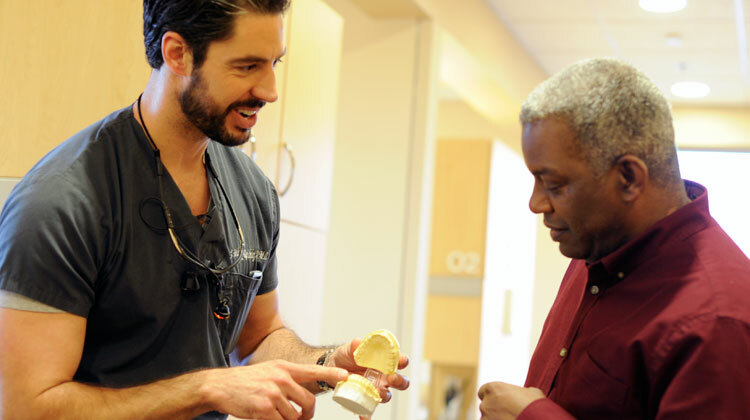 When any of my patients can benefit from dental implants, the first thing I explain to them is how simple it is to place the implant. Getting a dental implant sounds like it would be painful, but it’s not. In fact, there’s no swelling and very little downtime. You can come in for your appointment in the morning and be back at work in the afternoon. You can even go to the gym that night. Of course, this is only one of the reasons why many patients choose dental implants. The other reasons include the long-term benefits of replacing missing teeth and making dentures more comfortable to wear. Replacing missing teeth makes you feel better about your smile. It can be quite a boost to your confidence level. Dental implants also help preserve your other teeth, too. When you have missing teeth, the remaining teeth start to move around. As a result, this can cause them to lose bone and weaken. You can get gum infections, pain and might even lose a tooth. If you’re missing any back teeth, you may be putting more stress on your front teeth, which are much smaller. This can wear them out faster. A dental implant acts like a root does for a natural tooth. You can have one implant that anchors one implant crown – which is made to look like your other teeth – or the implant can secure a couple of replacement teeth, like a bridge or dentures. The first step is to surgically place the implant into the jawbone. This outpatient procedure takes about an hour. The implant, which is titanium, becomes part of the jawbone over the next few months. The next step is to take an impression of the implant at the gum level. I send the impression to a lab, which makes the implant crown. The implant crown fits into the implant, which is hollow inside but threaded. If you’re getting dental implants for dentures, the process is very similar except the dentures snap onto a locator on the implant. One of the advantages to using implants for your dentures is that it prevents them – especially the lower denture – from moving around. A lot of conventional dentures can feel bulky and make your mouth sore. Therefore, dental implants can take care of that problem. The dentures no longer rest on the gums. As a result, patients notice a big difference right away. Their dentures are so much more stable, more comfortable and they can chew a lot better. Dr. J. 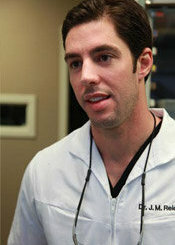 Mark Reichley is certified in dental implantology. He sees patients at Konikoff Dentistry’s Volvo Parkway location.